After a yummy breakfast of churros and chocolate, Jose drove me to the bus station. I was a bit nervous about using public transportation in Spain but the bus proved to be comfortable and uneventful. Spain is shaped like an upside down bowl, higher in altitude in the middle and down to sea level by the shores. Salamanca was a climb into higher altitude. I passed many rolling hills and mountains filled with snow (from a distance) and various animals. It was all very green and it seems as though Spain has a lot of open space. It was obvious that Salamanca was a beautiful town even from afar. The famous cathedrals still dominate over the city and it almost looked like a postcard version of what you'd imagine Spain to look like. We reached the bus station and I started the walk to Plaza Mayor, the most famous Plaza in all of Spain. Usually a plaza is dedicated to a king or government, but this plaza is dedicated to the people. As I neared the city, I was overwhelmed by the sight of many historical buildings and churches. Salamanca is a University town, with a prestigious school and about 7000 foreign students each summer. Lucky for me, I was visiting during a relatively quiet time. I had booked a hotel room right next to Plaza Mayor, and after a bit of searching and asking, I was able to find it. I checked in, headed to my room (it was nice and decently priced, especially for the location). 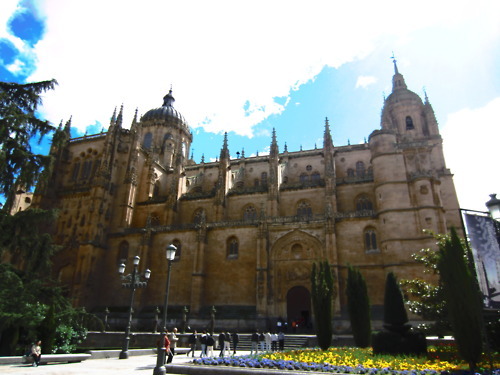 I had written up a quick itinerary of what I wanted to do in Salamanca, based completely off of Rick Steves' book on Spain. For Saturday, I wanted to see both the new and old cathedrals, the Church of San Esteban, and the Convent of the Nuns (Convento de las Duenas). 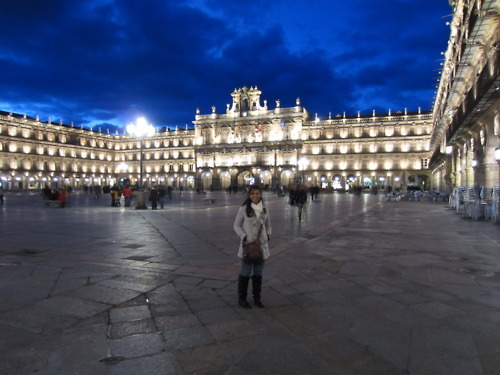 However, I really wanted to sit at the Plaza Mayor and observe my surroundings. I headed over around 3:00 p.m. and was met by a relatively empty plaza with many restaurants, cafes and stores enclosing it. There was a huge clock tower and arched walkways in each direction. I sat down at a table outside of Cafe Novelty and ordered a coffee with milk (cafe con leche). Over the course of an hour, I sipped my coffee and people watched. Ringing the plaza, there are medallions with the faces of many famous people in Spain such as Cervantes and Franco (not so popular). Apparently sometimes people throw tomatoes at the one of Franco. There were other tour groups, people walking around and some students talking and having fun. It was a nice way to spend an hour. a combination of Gothic, Renaissance and Baroque architecture. I spent about 30 minutes simply looking around the outside of the cathedral before actually entering inside. It connects directly to the old cathedral from the inside and all in all, I spent about 2.5 hours between both cathedrals, including climbing "Jeronimo" to the top of the Cathedrals where there were wonderful (but super windy) views of the city. I even watched a wedding happening in the old Cathedral! Afterwards, I had to decide whether I wanted to see the Church of San Estaban or the Convento de Las Duenas because I didn't have enough time to do both. I knew that the nuns had a shop which sold a speciality cookie called amarguillos and I wanted to make sure I purchased them. I basically ran through the Convento to the shop and bought 2 boxes of cookies right before it closed. I then headed to the Church of San Estaban and spent about an hour there looking around. I particularly enjoyed the giant music book and stand in the choir loft. Around 7:30 p.m., I was pretty exhausted from all the walking. On the way back to my hotel, I passed a restaurant/bar called Tapas 2.0, which boasted patatas bravas as one of their dishes. 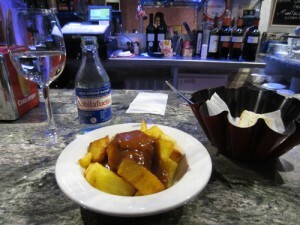 Patatas Bravas is a (vegetarian) speciality in Salamanca. I decided I would return there for dinner. I spent some time just resting and reading in my room till around 8:30 p.m. when I headed back to Tapas 2.0. I sat at the bar, and ordered food, and ate some yummy but very spicy Patatas Bravas. Now, in Spain, if there is one thing you should know, it's that you don't go to a bar and eat by yourself. Eating is Spain is all about being with people and enjoying a meal. So although pretty empty when I first arrived, it quickly filled up, and I did get a couple of questioning looks. Still, it was fun! I then decided to make another quick round to the Plaza and see if anything was going on. Now the one rule I've made for myself because I'm in Spain alone is to not walk around at night. It was rapidly shifting to darkness as I made my way to the plaza but I really wanted to see it lit up. It was beautiful at night and quite busy. Apparently Salamanca is a destination for Bachelor and Bachelorette parties, which Spanish people celebrate in an interesting manner. Basically, the bride/groom-to-be wears a silly costume such as a superhero, a baby or intensely-colored wigs. Then their friends proceed to make them do ridiculous dances or jump off light poles etc. There were many of these parties on the plaza. I learned all this from talking to a jewelry vendor near the plaza after seeing so many people in costumes. I then called it a night and headed back to the hotel. The next morning, I headed out around 10 a.m., leaving my bag with reception so it wouldn't bother me during the day. After a quick morning stroll around (the extremely empty) Plaza Mayor, I started walking towards the University of Salamanca, the oldest university in Spain (est. 1230), and back in the day, one of the most prestigious. On the way there, I stopped at Casa de Las Conchas, a house with interesting shell architecture and present day library. The University was right across, and I stared at the grand entrance for awhile trying in vain to find the skull with a frog that many students wish luck on. Afterwards, I headed inside and had a good time exploring the university and learning about the history. It also has one of the oldest libraries in the world, a fact that I found very interesting and exciting! It was even colder today then it was yesterday and I took the opportunity to do a bit of shopping after exploring the university and make use of the heaters in shops. I then decided I wanted to head to Casa Lis , a beautiful stained glass house which is presently an Art Nouveau Museum. I actually gasped when I walked inside and looked up. It was so pretty! I definitely recommend going inside and simply looking at the house even if you don't like art. I find art and art history very interesting so I spent about 2 hours exploring. There were exhibits of jewelry, perfume bottles, French bourgeoisie dolls, toys, sculptures and much more. It also had a very nice cafe, and I had a cup of chocolate for lunch (no you did not read that wrong) while getting a view of the River Tormes. Afterwards, the only thing left to do was head to the old Roman Bridge called Puente Romano which has parts that date back to ancient pre-Roman times. In addition, there is a faceless bull in the front which "guards" the entrance to Salamanca, and is the on the coat of arms of the town. By now it was about 3 p.m., and I needed to start walking back to the bus station at 4 p.m.to catch my bus. I walked back to Plaza Mayor and took one more loop around and sat down on a bench one last time. I then headed back to the hotel to get my bag around 3:40 and when I pulled on the door, it was locked. I basically went into full panic mode thinking I was going to miss the bus because the hotel was closed for siesta. Some other hotel guests came too and after a bit of asking, one of the staff in the restaurant next door informed us that the receptionist probably just stepped out to take someone to the parking garage and would be back. I didn't calm down until I saw her walking towards the hotel. I grabbed my backpack and walked to the bus station. The bus ride was uneventful and I was back in Caceres at 8:30 p.m. 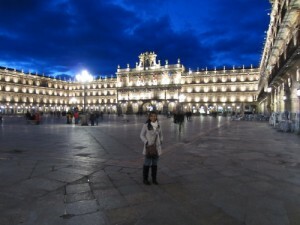 In all, I had a really great weekend exploring Salamanca. A lot of people have been asking me if I like traveling alone, and I have mixed feelings about it. I love that I can spend as much time as I want at each location and choose exactly what I want to do. I also really like conversing with locals and other tourists and the feeling of independence and confidence when I can maneuver through a strange city on my own. Here's to future adventures that are just as exciting!